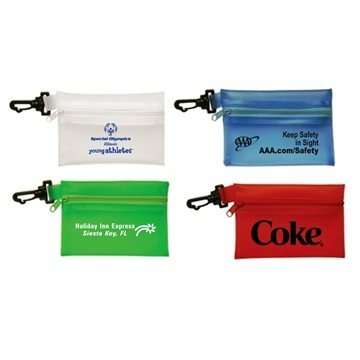 A great travel item, this PVC pouch with zipper closure and swivel clip would be a fitting giveaway at conferences, fundraisers and trade show events. Choose from the 4 vivid color options, and add your company name or logo to hand out the finished products to students, teachers and event planners. Please be advised that this pouch is sold without contents, providing plenty of opportunity for you to personalize the gift further! Makes shopping quick & easy! I really like the embroidered logo. It was easy to carry and distribute at a local parade. We are a picky bunch, and everything turned out perfect.